Late last night I found myself in a remarkable argument with my partner - she, growing up in Idaho, had been taught that Native Americans, regardless of tribe, generally lived short, brutish, savage lives of hardship. I argued otherwise, that life was certainly not idyllic but perhaps it was simpler and satisfying in a way modern society isn't, citing my own bloodline and stories told to me by Cherokee elders as I was growing up in communities in Wisconsin (off-reservation). She acknowledged that probably her histories are skewed by colonial perspective, but that I also am not arguing from a strong position. How do I know what life was actually like for Cherokees, pre-colonization, given that no elders are alive from that time? Given that I never experienced it? What about other tribes? I've done quite a bit of googling here, and my research is turning up abysmal results. From what appears to be undergrad webpages lousy with spelling errors to bite-sized BBC websites with almost no usable information (that just uses "Native Americans" without even mentioning tribe), I can't seem to find any authoritative sources on what life was actually like for the average Native American Cherokee, Kickapoo, Winebago, etc tribal member. I have a meeting scheduled next week with a librarian at the San Francisco Public Library which should direct me, but in preparation, are there any books of primary-source, or primary-source interviews, that demonstrate life for the average Native American tribemember? Preferably pre-colonization (or very early colonization). Preferably Midwest area tribes (Cherokee, Kickapoo, Winebago). Ideally such a history would also compare across several tribes, but I'll take what I can get and collate on my own if need be. So far the books I've found are clearly motivated by New Ageism or are relatively unsourced, dubious, yet colorfully illustrated children's books. The problem here is that there was no more an average lifestyle in North America than there was in Eurasia. Some peoples were hunter-gatherers, while others lived in densely populated agricultural civilizations. Even within those categories, there was great variation. Comanche* arguably lived lives much more like Mongols than they did like Cherokee. The Cherokee lifestyle wouldn't have looked crazily out of place to a central Asian farmer (aside from the lack of everyday metals and draft animals). Personal speculation here: Most pre-Colombian native people would likely have lived longer lives than the later European colonizers, due to not having to deal with all the endemic Eurasian diseases. The large cities that Europeans liked to live in were notoriously unhealthy places, and remained so until the advent of modern medicine. There would perhaps have been some diet-based differences though. There's currently a raging debate on the relationship of the Inuit diet to heart disease, and how much of that is from traditional diet vs. modern. If I were researching this, the people I'd go straight to looking for the longest lifespans would probably be the Pacific Northwest tribes, as they were hunter-gatherers in what is arguably the world's richest environment for that lifestyle. As for good books on the history of all of north America and its peoples on a macro level, I'd love to hear of one, but I've yet to find it. The best I've seen is the first third of Colin McEvedy's Penguin Atlas of North American History, but its coverage of this period is only good for an appetizer, with no main course available. The closest to a good large primary source I know of is the work of Francis La Fleche. He was a mid 19th century Omaha who got himself educated to a European-American standard and became one of the world's first native Anthropologists. His work with the (related) Osages was particularly valuable, because he hit them right when they were starting to convert to Christianity, so they still knew a lot of the old Wakonda (Great Mystery) religious practices, but didn't have the qualms they would earlier have had about talking about them. At any other time in history, he could not have gotten out of them the detail about their practices that he got out of them. One other thing that I just thought of (mad at myself for not thinking of this before): Your tribe, the Cherokee, are very unique in that they actually developed their own alphabetic writing system. It was post-contact, but the creator Sequoyah did not know how to read or write English. He just saw what the white folk were doing, and worked out how to do it for his language. Again, this is way post-contact, but the result was that there were actually Cherokee-language presses set up and newspapers. Its possible some of the early issues of the 1820's Cherokee Phoenix might have some of the slice-of-life information you are looking for. One very good book on this topic is 1491 by Charles Mann. The book gives an overview on what life in the Americas was like directly before and during the arrival of the first Europeans. It's written for laypeople, but it does give evidence and sources, if you want to do further research. 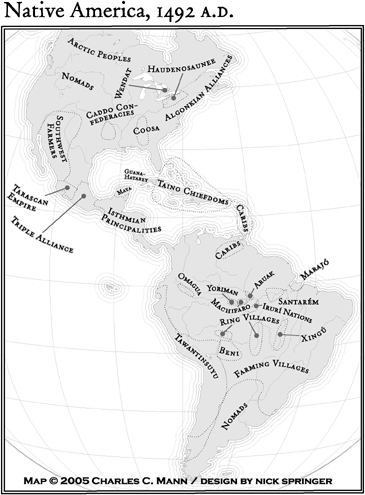 The book is more focused on South America and Central America, because the people who lived there had a more "complex" civilisation when Europeans met them, and more of the indigenous people are still around, so sources are much better. But it also describes the situation in North America. I've stated above that North American civilisations were less complex than South American ones (hunter-gatherers and small agricultural communities instead of city-states and empires). A good explanation for this is that the North American climate and geography does not support a more complex civilisation without modern technology. However, it's important to note that European diseases affected many parts of North America before any actual Europeans arrived there, so it's possible that a large part of the native civilisation was wiped out before the colonialists ever got to see it. Overall, I'd say the evidence points to Native Americans having good lives compared to their contemporaries in the old world. European settlers often stated that Native Americans were remarkably tall and attractive, which means they must have had good food and relatively little disease. In situations where a Native American ended up living with European settlers, they were generally eager to return home. On the other hand, there are many accounts of settlers who were captured by Native Americans and chose to stay with them rather than return to the other settlers. It's notable that a lot of modern American culture is adapted from what Native Americans did before European arrival. For example, many American foods were originally Native American. There is also speculation that the American political organisation owes as much to the Iroquois League and other Native polities as to European political thought. Of course, pre-colonial American life was much like any other pre-modern life, less comfortable than modern life. I'll assume that the general question of the advantages and downsides of pre-modern life is not relevant here, and compare the Americans to their contemporaries. After colonisation, life became much worse for the natives. First came the diseases, which killed a large percentage of the population, quite possibly the majority. After that, Europeans often displaced or enslaved the survivors. In the 19th century, many Native Americans were killed in wars, forced to migrate to a far-away part of the country, or had their children taken away to be educated by white settlers. In that time period, their lives probably did contain a lot of misery. From 1527-1537, Cabeza de Vaca traveled from Florida (after separating from the bulk of his expedition) as far west as modern-day Arizona before rejoining his expedition in Mexico City. Some times he was received as honored guest; others he served as a slave. He met tribes with bountiful harvests and tribes so starved for food they breast-fed their children until they were teenagers. When he returned, he wrote up his Adventures in the Unknown Interior of America as a report for his king. I don't know how accurate the details may be, but taken as a whole this shows how wildly different various tribes lived. Maybe of more interest to you because of your Idaho connection, in the 1840s (before the first permanent European settlement in Idaho), Father Pierre-Jean De Smet led missions to the Native American tribes in western Montana and northern Idaho. In his Origin, Progress, and Prospects of the Catholic Mission to the Rocky Mountains (a funding request to the parishioners in St. Louis) De Smet writes of one chief and "brave warrior," "upwards of 80 years of age" (if accurate, that indicates that all lives weren't "short"). His other writings may have more details of the lives of the Native Americans he lived amongst. If you want another first-hand account from the missions in Idaho in the 1840s, Father Nicolas Point traveled with De Smet, and in addition to his written journals describing his travels and the lives of the Native Americans he met, he also painted (also collected with his journals in Wilderness Kingdom) what he saw. According to the Diary of David Zeisberger: A Moravian Missionary Among the Indians of Ohio, Volume 1, based on his life with the Delaware Indians of Ohio between 1772-1782, the Indians believed fervently that they lived the "best of all possible lives", and often felt sorry for the white men. Zeisberger began his mission to the Indians with the Iroquois, in 1741. I ran across the quote while reading Zeisberger and Heckewelder a few years ago. I was unable to find the exact quote, so it may be from a different edition, or from Heckewelder. There would be no primary sources, per se, since few (none?) of the Native Americans had formal writing systems. The best you can do is look to early accounts by explorers, settlers, missionaries, etc. who did leave a written record. There's the mammoth 73 volume Jesuit Relations which contains detailed descriptions of life among northeast tribes, such as the Iroquois and Akwesasne. Of course, it's presented from the biased view of missionaries who felt they were living among inferior peoples who needed salvation. So, you have to read around that sort of attitude. The early volumes of "Annual Report of the Bureau of American Ethnology" would be another good source. Again, given the times that the early volumes were written, there will be a big Euro-centric viewpoint to look past. I recall The Voyages of Pierre Esprit Radisson having good info on life and customs of the Iroquois. It's been a very long time since I did any of my (amateur) research into pre-contact Iroquois life. My takeaway was that Native Americans lived rich and complex lives. The depiction of life as "short, brutish, savage lives of hardship" is about as far from the truth as what is depicted in the Pilgrim/Plymouth Rock stories they teach our kids at school. I argued otherwise, that life was certainly not idyllic but perhaps it was simpler and satisfying in a way modern society isn't. How do I know what life was actually like for Cherokees, pre-colonization, given that no elders are alive from that time? Given that I never experienced it? What about other tribes? And while the other answers explain why we know so few particulars about NA tribes pre-European contact, I submit there is another way to approach your questions. From the Science of Human Potential web-page we can get a qualitative understanding. 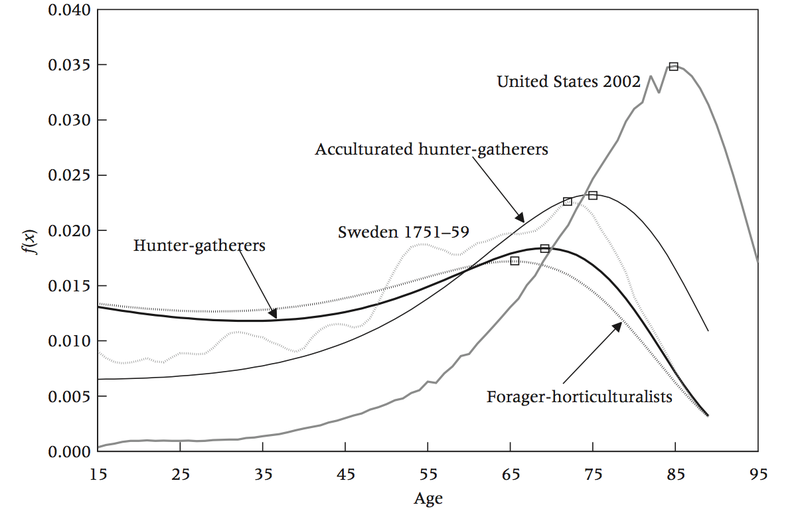 This graph shows that late stone age culture did not differ markedly over contemporary, more technological cultures, until roughly the early modern era. The Wikipedia page on Life Expectancy has several references that underscore the fact that technological innovation improves longevity but that the real increase in longevity only happens in the last 200 years or so. Drs. Rachel Caspari and Sang-Hee Lee (and other studies) noted when humans exhibit a change in trajectory towards longer average lifetimes. There is an emphasis in the development of culture based on the appearance of a "higher" cultural attributes. Most notably a strong and prevalent artistic expression that simply was not there before the Upper Paleolithic. Art did not make us live longer but we can take it as a sign that things were easier (art is a "leisure" activity) and human society was more complex (not everyone hunts and gathers). Furthermore, complexity allows for relationships that keep people around and useful for longer - grandpa can't hunt but he can teach the young more sedentary skills and tell stories that bind the community together. A tight knit community can better weather harmful changes in the environment and thrive in the good times. If a community thrives, so too do most of the members individually. Things don't get rapidly better again until the modern era of medicine - germs are a thing, washing is good, etc. - say by the year 1850. For most people, across cultures, what makes life most satisfying is felt and expressed meaning in our relationships. This is true even in the face of great hardships. Living longer only means you have more time to enjoy strong community or more time to feel the crush of an emotional void rooted in a lack of fellowship. There appear to be (for example) two books titled Prehistory of North America, written by archaeologists (which, archaeology, may be some alternative to "primary-source interviews"). Here I mentioned that there were "cities" of 2000 people -- "2000 people" may not seem like much, but, that was the size of most cities in England in the 14th century. Her saying "short, brutish, savage" might have been her refering to "warfare"? I don't know but it's worth considering that there existed wars and so on in Europe too. There were examples (places and periods) of relative peace, see e.g. five nations of the Iroquois Confederacy -- and examples of the opposite, see e.g. the Mesa Verde villages emptying, maybe caused by war, climate, or population migration, or all three. Not the answer you're looking for? Browse other questions tagged native-americans or ask your own question.